An explorer at heart, I am no stranger to driving around a town that I barely know in search of interesting restaurants, book stores and coffee shops. On a rainy afternoon in Nashville, Tenn., I was feeling the urge for coffee when I spotted an adorable, rustic looking sign. I had to check it out! 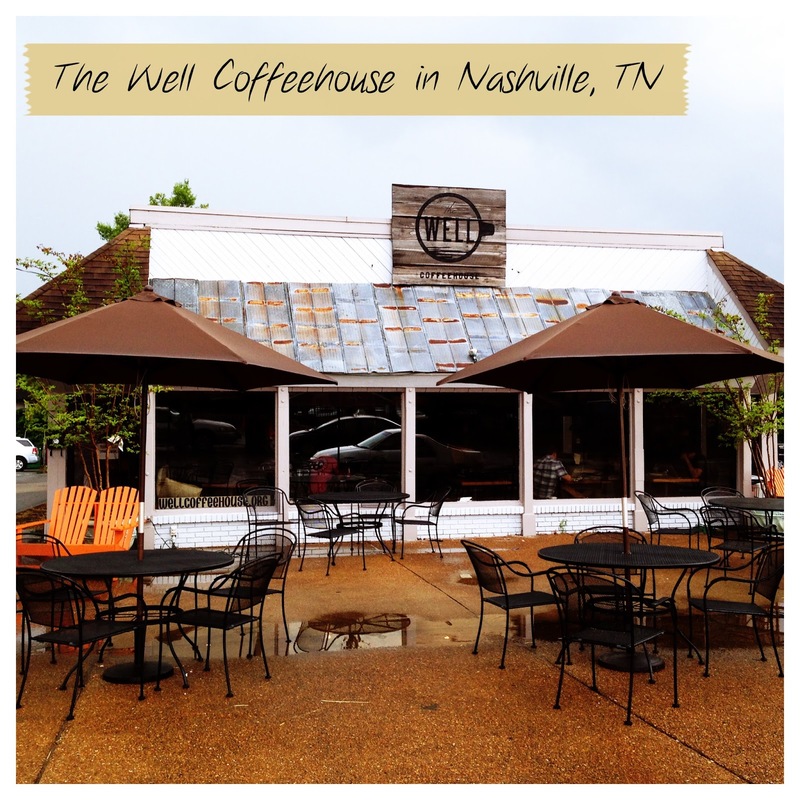 The Well Coffeehouse, in the Green Hills area of Nashville, gives patrons a chance to enjoy coffee for a cause. As a nonprofit missional coffeehouse, The Well makes money to give it away. Its vision is to end poverty for people in Ethiopia, Uganda, Romania and many more areas in need. By simply purchasing a cup of coffee, customers help people find the food and clean water they need to survive. The Well informed me that nearly 6,000 people die every day from water-borne illness. The coffeehouse partnered with The Living Water Project and Blood: Water Mission to combat this problem. Additionally, The Well has several retail items for purchase -- some that support an end to human trafficking. The Well had already set itself apart from other coffee spots. I was eager to be a small part of such a great mission. I knew immediately that this was a place you come and stay for awhile. (Although, they have a drive thru for convenience.) 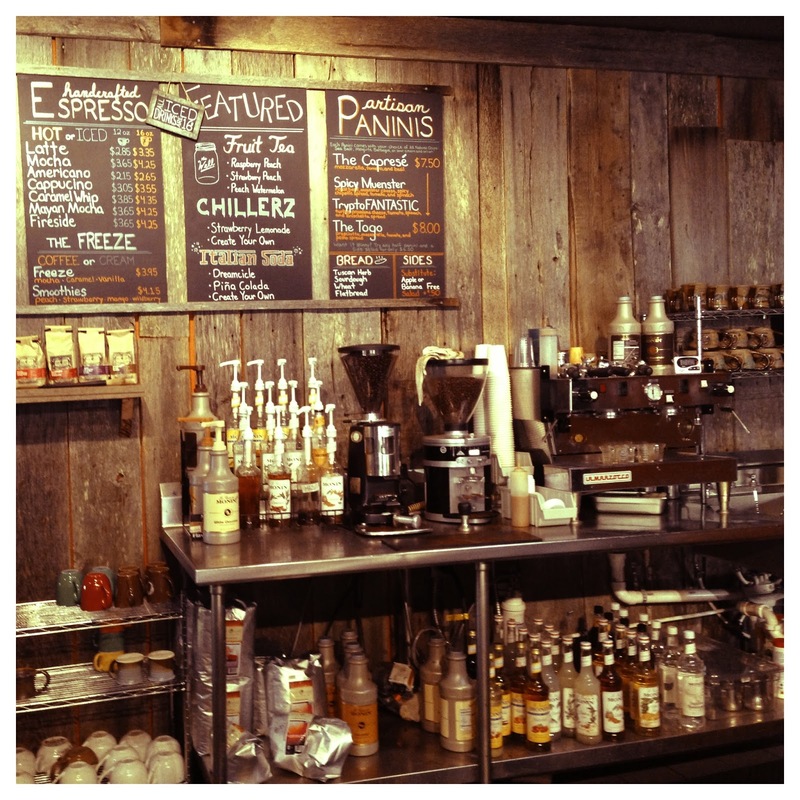 Locals come and enjoy their coffee surrounded by an atmosphere of exposed brick, chalk-board walls and wooden barrels. Everything draws the patrons to the mission behind The Well. One of my favorite parts of the coffee shop was the book nook. 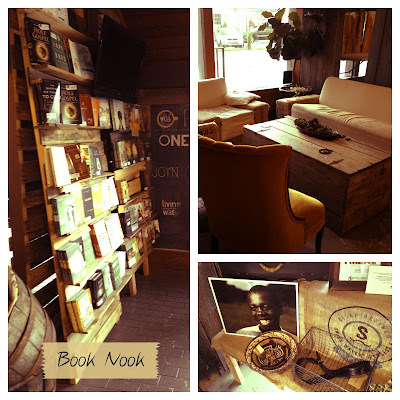 In the corner of the room, customers can leisurely sip their drinks while enjoying a variety of books. Some are for sale and others live in the shop. Before I settled down to read, I had to decide what to eat. If my aunt knows anything about me, it's that I am very picky about my salads. I usually go to restaurants and ask for substitutions and minor changes that would drive any chef crazy. Yes, I am that person! I decided to be adventurous and order the salad exactly as they prepare it. No substitutions! Let me just say, I was very pleased. The first thing I noticed was that they used spinach instead of lettuce, which is just how I like it. All of the ingredients were very fresh and the raspberry vinaigrette had just the right thickness. With sunflower seeds, croutons and feta cheese sprinkled on top, the salad was a perfect compliment to my TryptoFANTASTIC. What's a TryptoFANTASTIC? It's a turkey, provolone, tomato and spinach artesian sandwich with a delightful bruschetta spread. The menu offers several different bread choices, but I went along with good old fashioned wheat. The sandwich was lightly toasted and the tomatoes were especially juicy. Yummy! But, lets not forget the reason that I came. I needed my coffee fix. 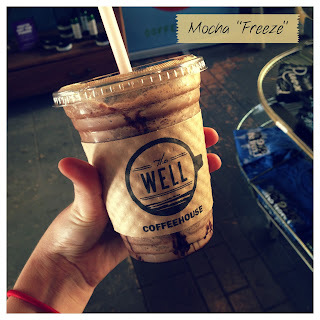 The Mocha "Freeze" was an absolute delight. As a coffee connoisseur, I have had my fair share of frozen coffee treats. I am always disappointed when my frozen drinks taste more like sugary syrup rather than coffee. The Well didn't have that problem. The drink was a perfect blend of freshly brewed coffee, mocha and milk. The drink was not overpowering, and it still gave me the kick I needed. As if wonderful coffee, tasty artesian sandwiches and a book nook wasn't enough, The Well had one more surprise. It's called The Wishing Well. In an attempt to bring the community together and give hope to those in need, The Well designated a wall for all those looking to give or receive a helping hand. I took the time to read some of the wishes, and I was touched by many of the stories. Suddenly, the perfect strangers who posted these amazing wishes seemed like old friends. Some people didn't bother to ask for anything but instead gave thanks for their families, homes and faith. It was a remarkable sight. I even knew which wishes had been granted, because The Well proudly stamps "COMPLETED" on every one that has come true. 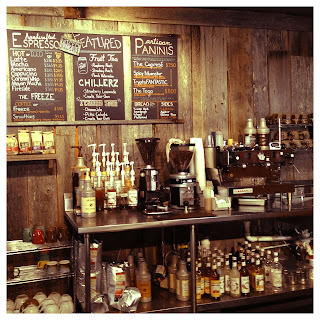 The Well is more than a coffeehouse, it is a place of hope. What a lovely shop! Too adorable! We thought so, too, Patricia. The mission makes it special. Thanks so much for stopping by!